One of the complaints I hear a lot about RVs is RV showers. This common complaint probably stems from RV showers being different than home showers. But it could also be the cheap shower heads most RV manufacturers install. First of all, taking a shower in an RV is a bit different than it would be at home. In an RV there are natural limitations such as water tank size, grey water tank size and the size of the water heater. At home, of course, there is a virtually unlimited supply of water and your hot water supply are only limited by the size of your water heater, unless you have a tankless water heater. However RV suppliers have mitigated most of the factors that limit the quality of the shower you can take in an RV by compensating on a few things. For example, the water heater in an RV heats water to 140° Fahrenheit which is much, much hotter than is tolerable by a human being. What this translates into is is that you have to mix in cold water meaning you use less hot water. So the typical six gallon water heater that is in most RVs is sufficient as you’re not using a great deal of hot water after all since that water is so hot. In other words, your hot shower has a lot of cold water mixed in. Secondly, all water sources in an RV are low flow. This is especially true of the shower head in an RV where the water flow can be as low a two gallons per minute. Even if you could stand using the hot water without mixing in any cold you could still get a three minute shower. And a trip to the ER for skin burns. The typical shower head that comes with most RVs is flat terrible. It’s short, the quality of the shower would make prisoners riot and it feels incredibly cheap on top of it all. Fortunately, there are replacements that are really, really easy to affect and not expensive. Simply put I recommend the Oxygenics products. Specifically I put the Oxygenics ETL 26781 in my RV and I couldn’t be happier. 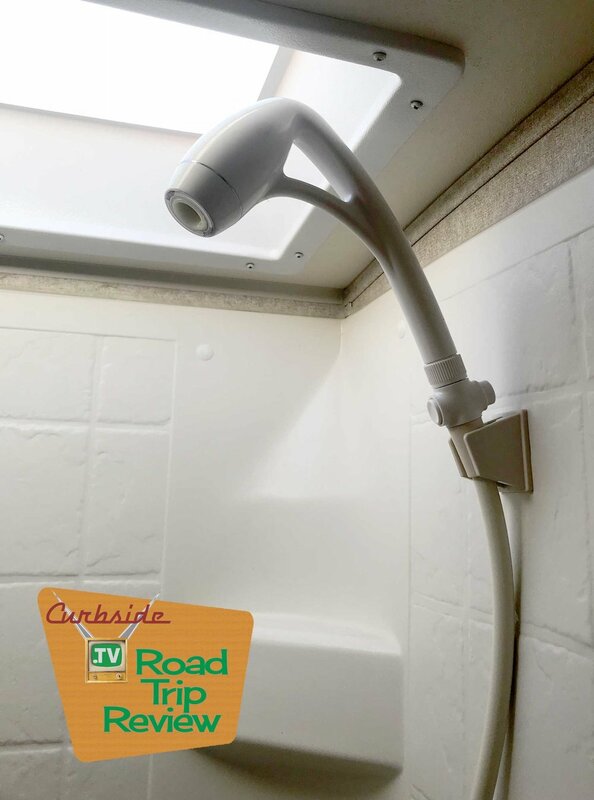 This little bullet shower head really improves the quality of the shower experience, making you feel like you’re back home yet still using only about two gallons per minute. There’s also a shut off button on the shower head but you’ll notice that it dribbles while it’s shut off. This is so that the water in your water lines doesn’t cool down blasting you with cold water when you turn the head back on again. This is really smart. When I installed this it took almost no tools. The hose that comes with the shower head just replaced the one I already had in the RV so it was literally a two minute (if even that) job to swap these things out. Unscrew the hose from the faucet in the RV and then simply replace it with the one that comes with the Oxygenics shower head. A little bit of plumber’s tape, which came with the shower head, made sure everything was snug. That short job made a world of difference in the quality of the shower. The shape and size of the actual shower head also raised the height of the shower such that I could stand under the shower head, which is sort of the whole idea. These Oxygenics shower heads come in a variety of finishes and, as usual, I bought mine on Amazon. If you have an RV I can’t recommend this more highly as a great replacement for whatever came with your coach. Unless, of course, it was this shower head.